It’s been a full year since Jimmy Fallon ascended the throne to take over the NBC powerhouse and longest running talk show in television history. What more inspiration was needed to celebrate? 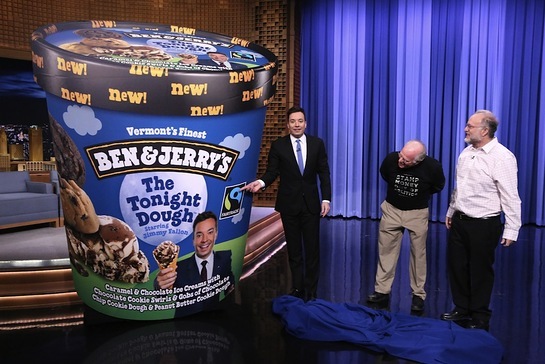 To recognize the accomplishment, ice cream Co-Founders Ben Cohen and Jerry Greenfield served up the aptly named “The Tonight DOUGH” to the Fallon faithful who were in the audience to witness the very first episode of season two. The concoction is caramel and chocolate ice creams with chocolate cookie swirls & gobs of chocolate chip cookie dough & peanut butter cookie dough. If the flavor becomes half as popular as the unflappable Fallon, who was recently dubbed “entertainer of the year,” it may give Ben & Jerry’s other classic combinations a run for their money. This is the second flavor for Fallon. The last, “Late Night Snack,” a foodie favorite named after “Late Night,” featured a vanilla ice cream, fudge-covered potato chips and a salted caramel swirl. Late Night Snack was phased out in 2013 when Fallon took the reins for The Tonight Show. So what sets this new combination apart from Fallon’s first foray into the frozen foods aisle? “The Tonight Dough is chock full of the stuff people love in Ben & Jerry’s pints,” said Flavor Guru, Eric Fredette, who created the flavor. "It is a double-double flavor with two ice creams, two cookie doughs and a crunchy cookie swirl. “We’ve gone way beyond salted caramel this time,” added Fredette. 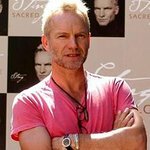 The talented performer also supports Ben & Jerry’s notion of linked prosperity in the commitment to help out the community. All of Fallon’s proceeds from the sales of The Tonight Dough will be donated to the charity SeriousFun Children’s Network. Founded by Paul Newman, SeriousFun provides children with serious illnesses and their families with a life-changing experience at camp that fosters confidence, independence and resilience – always free of charge. The new The Tonight Dough (#TonightDough) flavor is available in pints (MSRP: $4.89) and Scoop Shops nationwide. To learn more about The Tonight Dough or to find a store near you, visit www.benjerry.com or visit Ben & Jerry’s on Facebook.